The vape industry has been taking the world by storm, and the sudden popularity came with a wide variety of different vaping myths. Vaping facts and myths can be hard to separate at times, but there’s enough research out there now for people to get the truth if they know where to look. 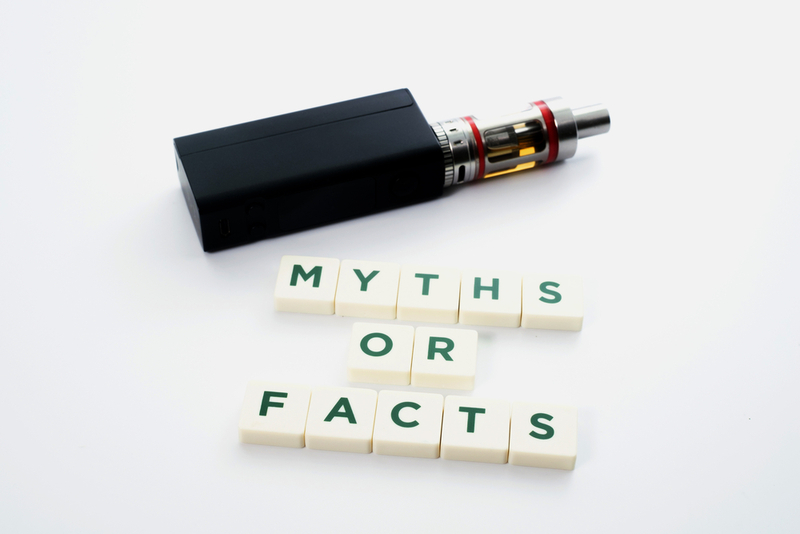 Read on below to take a deeper look at some popular vaping myths as well as the actual facts of the matter. This is one of the most popular myths about vaping, so it’s worth addressing right off the bat. The false narrative that vaping is a gateway to tobacco smoking became more and more widely spread as vape products gained popularity, and even some prominent news outlets seem to have taken the bait. The National Academies of Sciences, Engineering, and Medicine (NASEM), however, subscribe to science instead of click bait. A special NASEM panel investigated multiple studies which claimed vaping may prompt teens or young adults to try cigarettes. They ultimately stated that there is no empirical data to support a significant link between vaping and a long-term smoking habit. This myth started because antifreeze contains diethylene glycol, and e-liquid contains propylene glycol. Those names may sound similar to someone without a background in chemistry, but they’re completely different. The word those name share, glycol, is only used to reference any type of organic compound from the chemical alcohol family (not to be confused with alcoholic beverages). Propylene glycol, the one in vapes, is just an aerosolizing agent, or something that converts something into a fine spray. It’s also used to make asthma inhalers work. The EPA also notes that propylene glycol is commonly used for air treatment in places like restaurants, hospitals, grocery stores, and households. It’s used in things from food products to makeup. In other words, almost everyone encounters and ingests some amounts of propylene glycol regularly, and it’s not considered dangerous. Some rumors have said that vaping actually contains tobacco, or that it’s just as dangerous as smoking because some e-liquid contains nicotine. The first part of that claim is the easiest to debunk because you can see it for yourself. If you try putting tobacco in your vaping device, it’s not going to work. Look to the American Academy of Family Physicians (AAFP) to find more research about the difference between vaping and tobacco smoking. They clearly state, “e-cigarettes are far less harmful than conventional cigarettes.” The same study even says vaping may help adults quit smoking tobacco, and almost any scientific source will confirm that nicotine isn’t what makes tobacco so dangerous. Vape detractors have tried to claim that there’s just about everything in e-liquid, but the biggest myth we’ve heard besides antifreeze involves formaldehyde. Collectively, these represent some of the oldest (and most misleading) anti-vaping myths. Much like the antifreeze myth, the claims about formaldehyde are unfounded. Burning e-liquids at 800°F or more might produce worrisome levels of formaldehyde, but that’s roughly twice the temperature at which vapes work. Genuine studies find that vapes actually produce much lower levels of aldehydes than cigarettes– the levels are actually closer to the trace amounts you can find in normal room-temperature air. If you’ve heard the popcorn lung myth, you can rest assured that almost no e-liquid manufacturers in the world still use diacetyl (the chemical in question) anywhere in their plants, much less in the final product. Further, tobacco smoke contains diacetyl concentrations much higher than any known e-liquid that has ever existed, and no cases of “popcorn lung” (aka bronchiolitis obliterans) have ever been reported in relation to cigarettes. To learn more about the health science behind vaping, stop by South Beach Smoke and talk to our experienced staff. You’ll be happy to know that Drexel University scientists studied vape shops and found no evidence of harmful contaminants like dactyl, formaldehyde, acrolein, hydrocarbons, or other smoking-related carcinogens. You can also find testimonials online to learn how our own customers have benefitted from vaping.